HOW DO I PLAN A ROUTE? The first question most people ask themselves after they buy their first trail bike is "where can I ride?" The TRF can help with that. All of our 5,000 members have been in the same shoes at some point. The network of trails that cross England and Wales are varied in their terrain, landscape, and difficulty. It great fun exploring them. But, one thing you will find is that they can be hard to find, and their legal status can change over time. Fortunately the TRF has a wealth of information and help based around our members and local groups. We recommend starting by making contact with your local group. Most meet once a month and new members are welcome, and a lot also have their own Facebook Groups, websites and Forums that you can request to join. 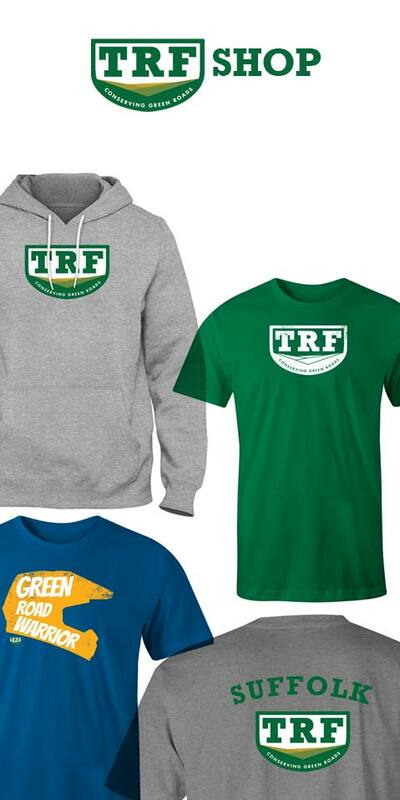 There's also the TRF Trail Website which is specifically designed as a Green Road resource for TRF members. New members who make an effort to connect and say hello will find that they get the most out of the TRF networks around the country. We've put together some helpful info on this page that should help you get started. See you on the trails! "I have a trail bike. Can I just ride anywhere off road?" 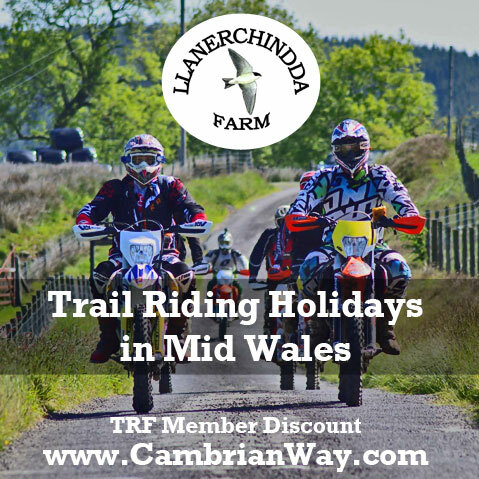 Trail riding in England in Wales is an immensely rewarding countryside pursuit, bringing adventure and exploration together with technical riding skills, orienteering and land access knowledge. It is enjoyed in sunshine, wind, rain and snow throughout the year in some of the countries most striking landscapes, from the wild moorlands of Northumberland, over the rocky mountains of North Wales to the flat farm plains of Lincolnshire and down to the furthest reaches of Devon and Cornwall. However, just because you own a trail bike doesn’t mean you can ride anywhere you like. In fact, responsible trail riders technically never ride ‘off road’ as the trails and green roads we use are actually classified as Byways Open To All Traffic (BOATS) or Unclassified Country Roads (UCR’s). Access to these historic legal lanes is under scrutiny by national and regional government organisations as well as land-owners and the wider countryside population. There are approx 208,000, miles of road in England and Wales, 115,000 miles of footpaths, bridleways and restricted byways, and 6,000 miles of BOATs. The TRF exists to help preserve access to these historic BOATs by working with (and sometimes lobbying against) lawmakers as well as helping new and existing members learn where they can and can’t ride (and why), promoting a confident and responsible code of conduct that ensures all countryside users are able to enjoy our diverse landscape well into the future. Can’t tell your BOAT from your UCR? "What about other countryside users?" You love motorbikes. You love the countryside. You love adventure and exploration. You love mixing them up and enjoying a day trail riding. Great. Whilst out on your bike you will come into contact with a whole range of other countryside users, walkers, cyclists, horse riders, farmers, countryside residents. Everyone that enjoys our natural landscape has a responsibility to make sure that they are respectful to the land and other users. In the case of trail riding, all TRF members agree to abide by and promote our code of conduct. *Trail riding is lawful on green roads which are commonly known as unclassified county roads, or which are classified as Byway Open to All Traffic. If in doubt, check with the Highway Authority or the TRF. Motorcycles and riders must be road-legal. Green roads are subject to the same laws as black roads. *Endeavour to travel with least impact. Ride in the 4x4/tractor ruts and avoid creating a third rut, where safe, reasonably convenient, and possible to do so. Avoid straying from the road, especially onto moorland or farmland – doing so may be a criminal offence. *As a courtesy, on narrow black roads or green roads, stop and switch off engines when sharing the road with ridden horses. *Ride at an unobtrusive speed, taking regard of conditions and visibility. Be prepared to stop within a maximum of a third of the distance in which you can see the road ahead. Excessive speed increases wear on the road surface, avoid travelling at high impact speeds above the voluntary recommended maximum of 25mph. *Machines must be effectively silenced. Use the throttle with discretion, as noise does offend. Green roads are subject to the same laws as black roads. *Respect the countryside and those who live, work and play in it. Green roads can be valuable habitats for wildlife, take especial care in spring and early summer. Fasten gates to safeguard stock, except those tied open for land management purposes. *Be courteous to other road users and respect their equal entitlement to use the road. Bear in mind the difficulties of others and try not to add to them. Acknowledge others with a friendly wave or other suitable gesture. Responsible trailriding is a form of quiet enjoyment of the countryside. Maintain the standard of a responsible trailrider, so as not to disturb the tranquillity of National Parks and peaceful areas of the countryside. "What bike do I need?" Riding Green Roads is not riding 'off-road'. In fact all the trails that the TRF ride are legally classed as roads, it just so happens that they are unsurfaced. This means that the law that applies to your trail bike is the same as the law that applies to a road bike. It must be legal, taxed, MOT'd and insured. 'What is the perfect trail bike' is a often asked question with no definitive answer. Everyone will have a different opinion, from those who prefer the classic old school twin shock machine, to those who prefer more modern enduro based bikes. 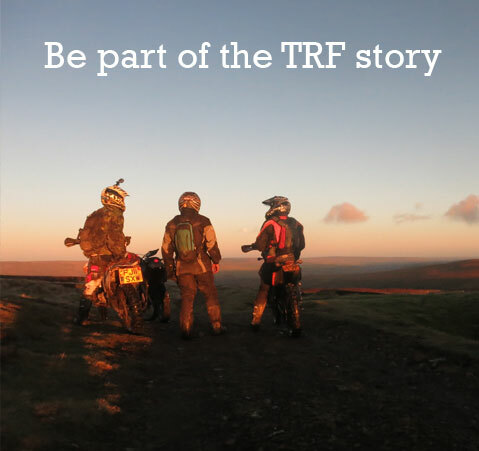 If you haven't bought a bike yet then your local TRF club is a great place to start, you'll find members have a wide selection of machines and will be happy to share their experiences. 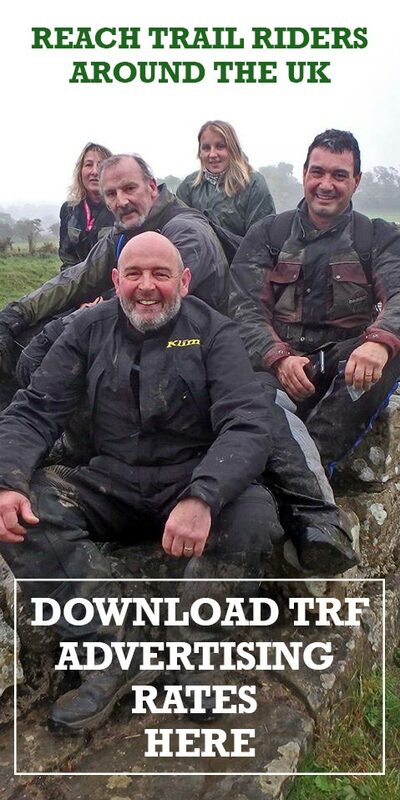 We've also got a page on our Trail Website dedicated to capturing reviews of members bikes that you might find helpful. "How do I plan a route?" Finding where you can and can't ride is a little bit of a dark art, however once you begin to understand how to find Green Roads on maps and check their legal status you'll find that it all starts making sense. The next stage is actually planning a route, from a short half day to multi-day trail riding adventures. The chances are your local TRF club will hold club nights where maps are marked up and members share information about routes in your area. Often the best way is to just get out riding as part of your local club and over time you will begin to understand how routes are put together. It's not just about finding the the Green Roads it's also about how to link them together with interesting road miles. We have a collection of resources on our Trail Website that are designed to help get to grips with route finding and planning.